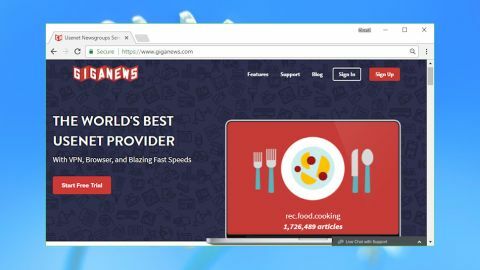 There are cheaper Usenet providers around, but Giganews scores with us for its reliable network, performance and support. Giganews started life back in 1994 with just one news server on a single workstation. The company has since grown into a massive Usenet operation with four data centers across the US and Europe, but it still takes a very hands-on approach, running its servers, writing code, and building and managing its own network. This size brings some important advantages. More locations improve speeds as you're more likely to have a data center near to you. It also means the company can guarantee 100% uptime, as even if one server is down or having a maintenance update, there's always a backup available. The headline retention figure looks low at ‘five years plus’ or more than 2,000 days, especially when other providers claim nine years, but the full story is a little different. Giganews claims to offer a higher quality of binary retention with 100% completion, multiple article copies, and full speed delivery of even the oldest articles. And text retention is even more impressive at 14+ years. Giganews has plenty of extras, too. A free Usenet browser helps you search and download files, the Giganews accelerator aims to secure and optimize your connection, and there's an option to protect your anonymity with the excellent VyprVPN (which as you might guess, is a VPN service). The company offers several limited bandwidth plans. These start with Pearl, which gives you 5GB of data a month and 30 days retention for $4.99 (£4). Ramping up to the Silver plan gets you a 50GB allowance and 5+ years retention for $14.99 (£12). The Platinum plan provides unlimited access, 20+ connections and a basic VPN for $19.99 (£16) a month. The top-of-the-range Diamond plan supports 50 connections and gives you more options, but seems expensive at $29.99 (£24) a month. There's a 14-day 10GB trial available if you'd like to find out more. A few providers have more generous terms – Newshosting gives you 30GB, for instance – but 10GB should be enough to run basic checks on speed and retention. Free SSL support enables users to encrypt their connections, making it more difficult for their ISP and other third-parties to see what they're doing online. The Platinum and Diamond plans also include a VPN in the shape of GoldenFrog's VyprVPN, allowing them to get one of 200,000 available IPs covering 50+ countries. Buying the Platinum plan gets you the bare minimum of VyprVPN features. It only supports the PPTP protocol (no OpenVPN), reducing its security value, and allows one connection only. Opting for the Diamond plan gives you the much better VyprVPN Pro. This supports PPTP, L2TP and OpenVPN protocols, adds VyprVPN's Chameleon to help bypass VPN blocking, includes a NAT firewall, and allows two simultaneous connections. It's a good package, but keep in mind that you can buy a more capable package direct from VyprVPN for under $8 (£6.40) a month. The Giganews signup process requires you to provide more personal details than usual, with the website asking for your name and physical address, as well as your email. You're also required to enter your payment details (card and PayPal are supported), although you won't be billed for 14 days or until you've used 10GB of data, whichever comes first. Once the account is active you're able to log in to Giganews' Control Panel. This is a handy web console which displays your account details and shows the data you've used this month, including the statistics on individual sessions. Unexpected extras include an Account Recycling feature. Turn this on and if you hit your monthly transfer limit early, Giganews can automatically start (and charge for) a new month of service. It's a simple way to prevent your service being interrupted, although if it happens a lot, you might save money by switching to one of the unlimited accounts. The console has a download link for Mimo, Giganews' Usenet browser. This is Java-based and runs on both Macs and PCs, which is convenient. Basic operations work just as you'd expect – enter a search keyword, select and download one or more of the results – and even total beginners will quickly figure out the fundamentals. There's not a lot of depth to Mimo, though. It doesn't have the features or power to stand up to the competition. It can't be used with services other than Giganews, and it doesn't seem to have been graced with a significant update since 2012. Mimo is better than nothing, but it's not the major plus that the Giganews website seems to claim. A separate Giganews Accelerator tool is even older, with most of its development done back in 2007. It works as a proxy and can add support for SSL connections and Usenet header compression, assuming your client doesn't support these already. More usefully, it allows you to limit the bandwidth used by Giganews downloads, hopefully ensuring you can browse and use other internet apps while you're grabbing files. Whatever our issues with these extras, the core Giganews service performed very well. We set it up on both Mimo and Grabit, managing to reach download speeds of 40Mbps with just five connections. Exactly what you'll see will depend on your location, whether you're using a VPN, and other considerations besides, but there should be more than enough speed for most people. Giganews is a premium Usenet service with a speedy network and some powerful features, particularly the bundled VyprVPN. This doesn't come cheap, and the company may not appeal to bargain hunters, but if quality is your top priority then it's worth a look.